However, sentiment surveys that focus on individuals' (consumers and workers) perceptions of economic data points are decidedly favorable. 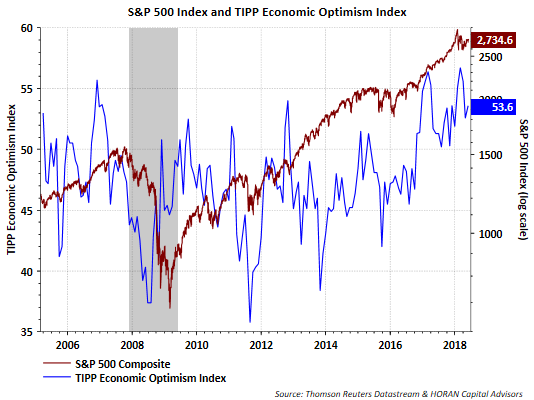 One such measure is the monthly IBD/TIPP Economic Optimism Index. This index is, "a collaboration of Investor's Business Daily and TechnoMetrica, gauges how confident consumers, workers and investors are in the pace and direction of the U.S. economy. 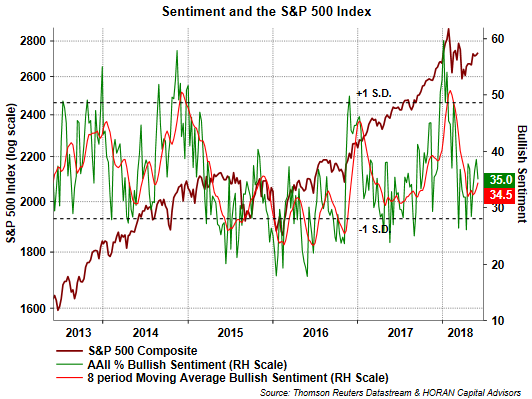 As with all of IBD/TIPP's proprietary monthly indexes, a reading above 50 signals optimism, below 50 pessimism." This index has been above 50 since October 2016. 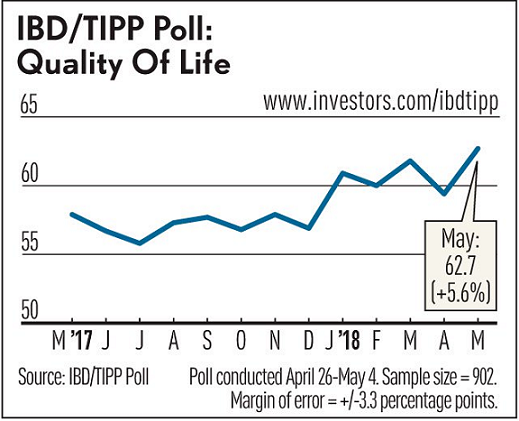 Two other components to the IBD/TIPP report is the Quality of Life measurement and the Financial Stress Index. The Quality of Life Index hit a 14-year high with the May report and the Financial Stress Index is at a record low for that index. Two related factors are likely contributing to these favorable poll results. First is the rise in median household income. The Census Bureau tracks this data on an annual basis with a significant lag. 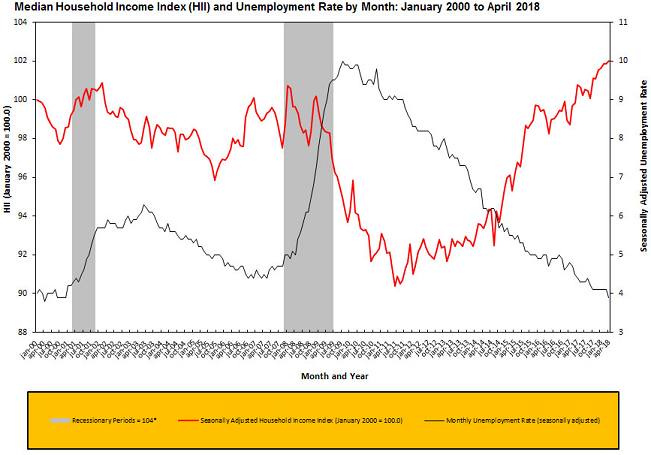 However, Sentier Research tracks the data monthly as displayed below in the household income index. As reported by IBD, median household income is at its highest level, after adjusting for inflation, in almost 50 years. Also included in the above chart is the unemployment rate which was reported at a better than consensus 3.8% on Friday. Notable in the employment report was the 2.78% year over year increase in average hourly earnings. 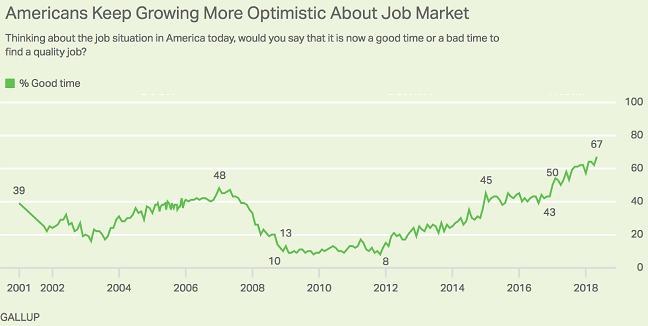 With a low level of unemployment, rising average hourly earnings and positive consumer sentiment, it is not a surprising that in a recent Gallup survey, 67% of survey respondents are saying now is a good time to find a quality job in the U.S. This is the highest level reported by Gallup in the seventeen years it has been asking this question. 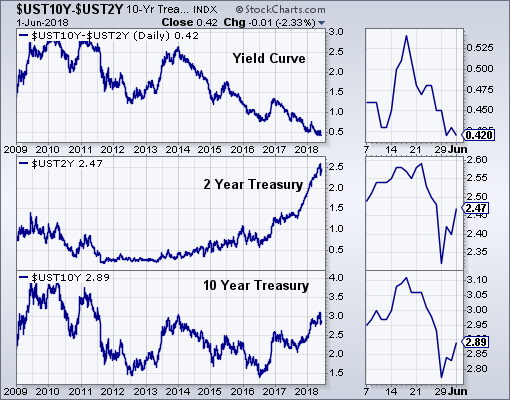 And lastly, there continues to be quite a bit of angst with the continued flattening of the yield curve. I recently wrote about the negative market implications of an inverted yield curve, but I continue to believe an inversion does not occur near term. 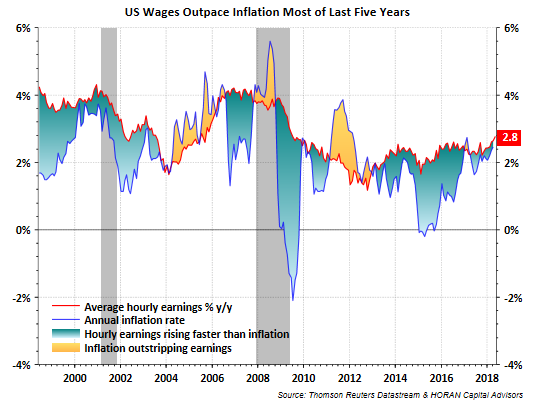 The continued rise in average hourly earnings which are outpacing inflation, a continued trend higher in median household income growth, a tight labor market and positive individual sentiment, I believe, translates to stronger consumer spending and potentially higher inflation. A higher level of inflation will result in a continued trend higher in the 10-year Treasury. As I have noted recently, historically, stocks have performed well in a rising interest rate environment. Readers will likely find the two articles below worthwhile reads as well. Why Stocks Like higher Rates: In the report Ryan Detrick notes, "since 1996 there have been 11 periods of a higher 10 year yield and the S&P 500 was higher all 11 times. The Stock Market Will Go Much Higher And Its Strength Will Be Shocking: "...rising rates are typically a precursor to economic strength. The S&P 500 has a strong positive correlation with the direction of the 10-year Treasury yield." In investing there are no certainties. Higher interest rates seem to be something investors will need to contend with in the balance of the year though. With these rate moves will come an increased level of market volatility, but the higher volatility is at a more normal level and likely continues in the second half of the year as well.